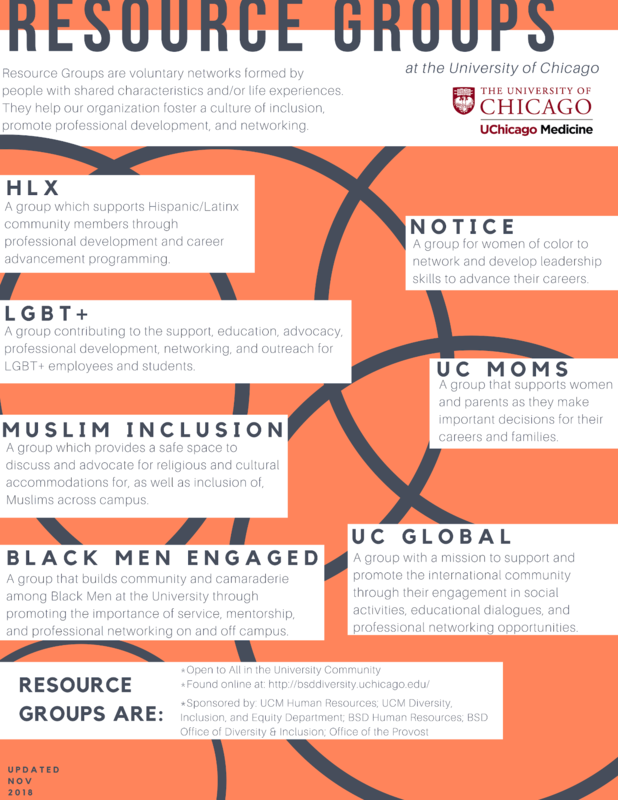 The University of Chicago Biological Sciences Division and UChicago Medicine supports and encourages the formation of Resource Groups (RGs). Resource Groups foster diversity and inclusion by helping create safe welcoming environments where an individual’s race, ethnicity, gender, levels of ability, religious beliefs, sexual orientation/gender identity and other important personal attributes are viewed as organizational assets. RGs are open to all members of the University of Chicago community including faculty, staff, post-doctoral researchers, residents, and students. Click here to view the Resource Group FAQs. Resource groups may be formed and led by staff, faculty, other academic appointees, postdoctoral researchers, residents, and students. If you are interested in forming a Resource Group, a helpful first step is to schedule a meeting with a BSD HR Diversity Committee member. This informal meeting is an opportunity to learn more about the process of forming a group and a time to ask questions you may have. We recommend reviewing the Resource Group By-Laws and Application prior to the meeting.